I'm looking to mark my work so I'm considering the options. Quite a few makers have their name stamped on the chanter in letters of a couple of mm's. I've looked at buying a name stamp, but I'm curious about how others apply it (if indeed, that's how it's done). The idea of spending hours working carefully on a delicate chanter then hitting it hard with a hammer to put my name on it is doesn't make sense to me. I wondered if these were perhaps branded rather than stamped, but looking at a couple of boxwood chanters I can't see any evidence of heat. Laser marking machines are proliferating now ( I design bits that go in them!). Maybe try and see if there is a local company that can offer that service, they can try out a few variations on a scrap round of timber before committing a chanter. It sounds aggressive but its a very controlled process where measured amounts of laser power are delivered to produce really nice clean and precise lettering and logos. I had a stamp made when I first started. The stamp originally has M NELSON with Cambridge underneath but I filed off the Cambridge as it made getting a good impression tricky. 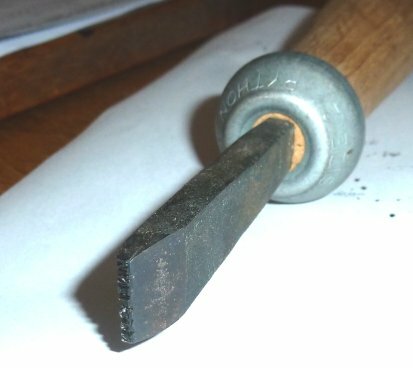 My method is to heat the stamp and test it on a scrap of black wood of similar diameter to the chanter and once it gives a clear impression when firmly rolled around the chanter surrogate by hand, repeat it on the chanter. It is important to keep the stamp perpendicular to the chanter surface and to do the impression in one hit as it is very hard to go over it without making it worse. I need a new stamp myself, will probably email them. Thanks Alec, Mike and Richard. Alec, I haven't heard of this technique before - I'll look it up. I'm guessing it's not a thing to be done at home on a small scale. Mike and Richard, I thought that might be the way some do it. 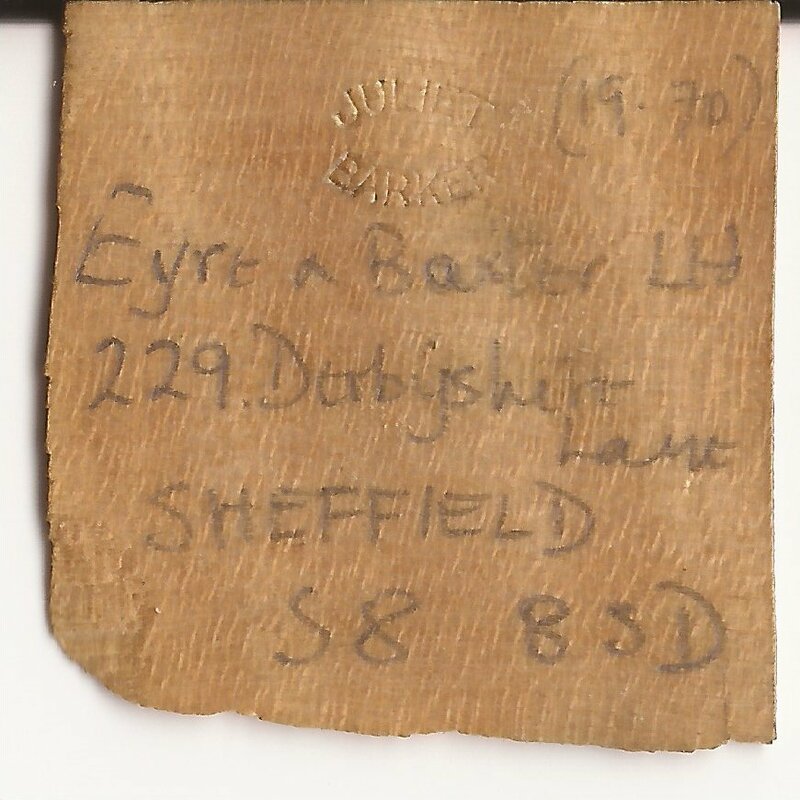 In particular I'm delighted to see there's still a firm offering stamps for wood made in the old style and with the correct angle for making a suitable impression. I got mine in a 19C style from two elderly guys running one of the last workshops in Clerkenwell, London, and had guessed that we might not easily see this sort of thing again. I don't know if the cutting edges are hardened - I suspect not - but in any case little force is needed. Such a thing will be easily damaged anyway, so it needs to be well protected when not in use. Woodwind makers of the past seemed to have been considerably less fussy about neat stamping than we are likely to be today, and some immaculate work is often seen with quite crooked stamps. Blackwood stamps well without the use of heat, as does boxwood. In the case of the paler wood you hold the end of a stamp in a candle flame to acquire a carbon coating and that gets impressed into the wood fibres. Some practice on scrap is important and, as Mike says, you really only get one go at this, as accurately positioning the stamp for a deeper impression is virtually impossible. If Alec’s suggestion of laser marking can be carried out at reasonable cost, that sounds another excellent method. Thanks Francis. I've just had mine delivered, made by this company. http://mshaw.co.uk/portfolio.htm It cuts a lot easier than I thought it would, so hand pressure alone is good enough for Blackwood.